first explored by parties from the American Museum of Natural History in the 1920's. Many important discoveries were made there, including the first actual evidence of egg laying and nesting behaviour in dinosaurs. Protoceratops, an ornithischian dinosaur, was found there along with nests of eggs that contained preserved embryos. 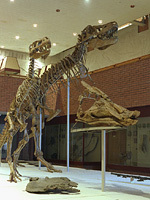 At the time these photos were taken (early 1990s), many of the Mongolian dinosaurs from the PIN were part of a traveling exhibit to Australia and Japan. 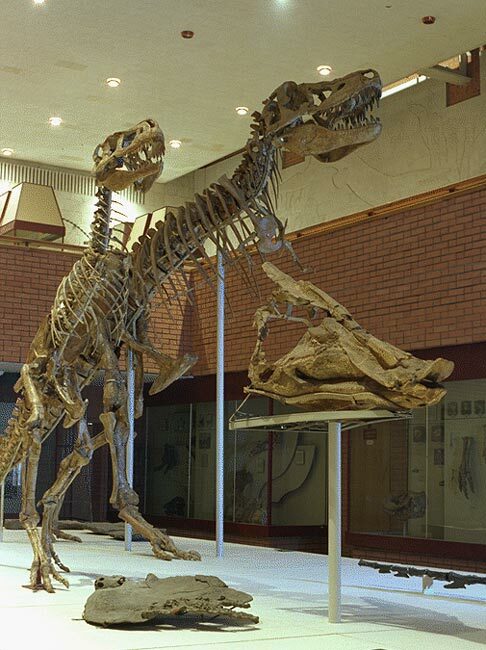 They still had two skeletons of Tarbosaurus (left), a theropod dinosaur related to Tyrannosaurus rex. These are from the Upper Cretaceous Tsagan-Oola Formation, and are about 70 million years old. In front of the tarbosaurs is the skull of Saurolophus angustifrons, also from the Upper Cretaceous of Mongolia. It is an herbivorous "duck-billed" dinosaur of the ornithischian, or "bird-hipped" group.